Food Production Company | Moveable Feast, Inc. The exceptional freshness and quality of our smoked salmon has earned Chef Alain's Moveable Feast, Inc.a reputation of excellence within the food industry. Since 1998, Moveable Feast, Inc. has been curing, smoking, packing and selling cold smoked salmon. Alain Quirin, owner and master smoker is committed to providing his loyal customers with a product that offers consistent freshness, quality, texture and taste. In fact, Chef Alain specializes in cold smoking salmon the traditional way. using only the freshest salmon, salt, and natural hickory wood smoke. And, you can depend on the sanitary conditions of our facility, All of our salmon is meticulously handled under Federal Seafood HACCP regulations from the time it is received until the time it ships to our customers. The smoking facility located in Moonachie, New Jersey was designed, built and equipped specifically to smoke in small batches. This intentionally ensures better control of quality and flavor. Once you taste the smoked salmon from Moveable Feast, Inc. you will know why smoked salmon connoisseurs, chefs, restaurateurs and sushi lovers have made Chef Alain's their preferred smoked salmon. We provide a cold smoked salmon of consistent and superior freshness, quality, texture, and taste. Chef Alain is truly committed to his craft. With over 40 years of food preparation experience, he began his career in Europe working for some of the most prestigious hotels and then in well-respected and trendsetting restaurants in New York City. Now as a master salmon smoker he is dedicated to perfecting his craft. Chef Alain is committed to producing a high-quality smoked salmon that is appreciated and admired by other Chefs, and that's worthy enough to bear his name. 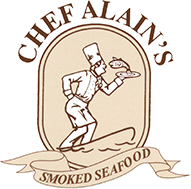 Because of his tireless dedication to his brand, Chef Alain's, Moveable Feast, Inc. has maintained an excellent reputation within the industry and became a highly sought-after product.